Residenza Villa Marignoli Rome is a complex of self catering holiday apartments and suites to rent for short or long stays in Rome. Carefully renovated to its previous Art Nouveau glory in a Liberty style, the holiday residences in Rome are available for visits of up to 3 months at extremely reasonable rates. 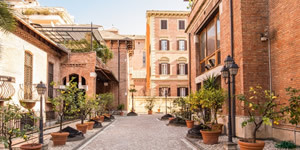 This comfortable and elegant vacation accommodation in Rome sprawls over two historic buildings connected by a charming garden. Designed by the famous Italian architect Giulio Magni, the suites come in various sizes that either overlook the interior garden or the ancient Aurelian Walls. Decorated and furnished in a simple and yet comfortable style, the holiday apartments of Residenza Villa Marignoli Rome offer a cosy and homely feel. The spacious rooms and living areas are perfect for families and other groups and the internal garden terrace is the perfect place to relax and socialise together. 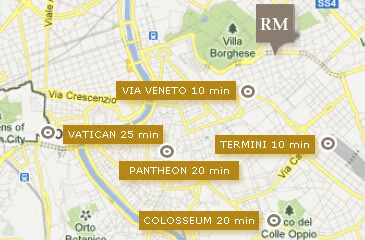 Piazza del Popolo – 25 mins leisurely stroll through Villa Borghese or 2 metro stops north (6 mins) from Barberini. When visiting a city for a holiday, you quickly learn that location is all important in getting to see all you had dreamt of seeing rather than spending your time always trying to get there. At the Residenza Villa Marignoli guests can rest assured that they are in easy and quick reach of the city’s main tourist attraction, either by foot, or by using the excellent transport links. 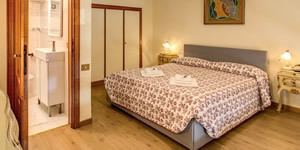 Located just 2 minutes walk from one of the city’s most beautiful parks – Villa Borghese – which contains fantastic art galleries, boating lakes, elaborate fountains and other delightful spots, our holiday accommodation is also just a short walk from the Spanish Steps and Piazza del Popolo and of course their fantastic underground stations. The suites available vary in size according to the needs of the guest, but in each apartment there is a fully fitted kitchenette, amply sized bedrooms and dining & living rooms to relax. The properties also come with air conditioning, heating, washing machine (only in the executive apartments), hairdryer and satellite TV. Although the accommodation is self-catering, we nevertheless offer certain services to make guests’ stays as comfortable as possible with daily cleaning (excluding holidays), biweekly linen changes, a laundry service on request and a 24hr reception desk. Why not take a quick look at our Apartments & Rates section for more in depth information on the great facilities offered to our guests. Residenza Villa Marignoli Rome is perfect for those looking for cheap yet comfortable accommodation and appreciate excellent value for money. 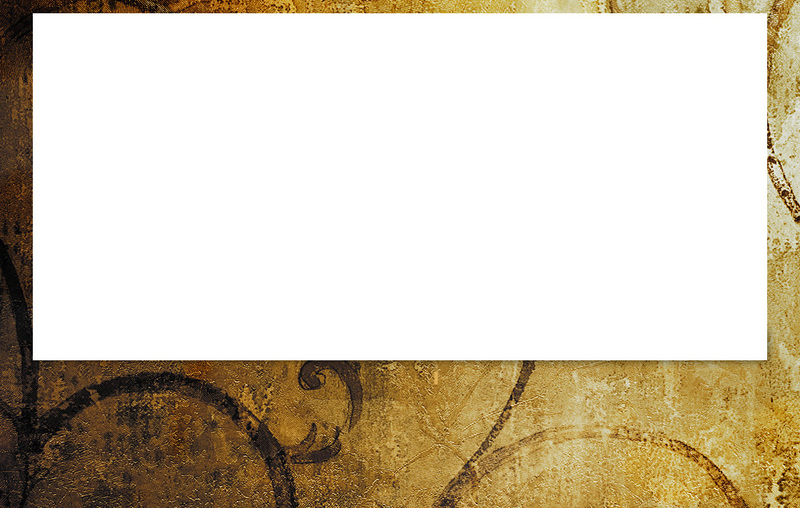 By using this Official Site you are also guaranteed the best rates possible... - so why delay? - Book your stay with us today! !